EVANS, Ga. - As you make your way around Bartram Trail Golf Club for the first time, if you were hurried and didn't have a chance to glance at the scorecard, you'll start to notice something unusual. Bartram Trail Golf Club has a nice, rural feel, with no homes. 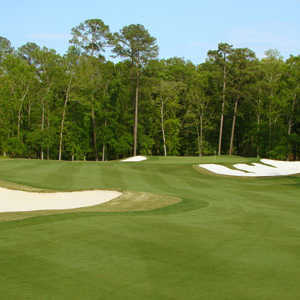 Bartram Trail Golf Club in Evans is situated just minutes from Augusta National. Despite the fame of its neighbor, Bartram Trail stands out for being Columbia County's only public golf course. It has a location next to Patriot's Park that provides forests of mature hardwoods and pine trees that were fully utilized in the design. "Hmmm, didn't we just play a par 3?" "Wait a minute, didn't we just play a par 5?" Your musings would be on-target. Architect Rick Robbins, who served apprenticeships with Bruce Devlin and Robert Von Hagge and, later, with the Jack Nicklaus Group, stepped out of line a bit from traditional routing. Robbins designed five par 3s and five par 5s at Bartram Trail, a contrast from the usual four of each. It's a little disconcerting at first, all those short holes counterbalanced with the long ones, but it does provide a break from the routine. Not that the layout needed any quirkiness to keep it interesting. It's a very picturesque course, just minutes away from Augusta, which has a collection of good courses many people may not know about, overshadowed by the brilliant light shone by Augusta National. Bartram Trail has a nice, rural feel, with none of the homes that tend to mar golf course landscapes these days. 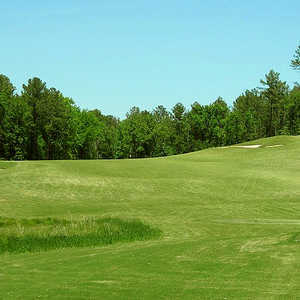 Located next to Patriot's Park in Evans, the course makes use of the rolling terrain with hardwood and pine forests. 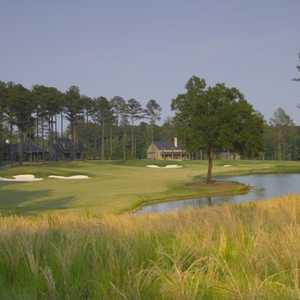 The fairways have excellent movement, dipping, rising and rolling through wetlands. You would have expected nothing less from a course named after the famous naturalist, William Bartram, who cataloged native flora as he hiked around the Southeast in the late 1700s. They take their nature seriously here in the lower Piedmont and upper sand hills. "I like that course because it seems to be away from everything and they keep it in great shape," said James Palmer, a mid-handicapper who has played the course several times and considers it one of his favorites in the area. "And it can definitely be hard." Especially from the back tees and, in some cases, the middle tees. The closing hole of the front and the start of the back are particularly dangerous. No. 9 is a 511-yard par 5, a slight dogleg left, throws a partially blind tee shot at you to a fairway split in two by a ravine/wetland area with woods down the left side. Fairway bunkers are to the right, but the aggressive players will stay left anyway. No problem trying to reach in two here, it will actually help your third shot, if you can manage to keep your fade under control and stay left. Then, no. 10 is a 404-yard par 4 with a blind, uphill tee shot. The fairway tilts right and drops off to woods. The green is shaped like an upside down "L" with a bunker middle left of the green. It's a three-tiered green with the high side being in the middle; easy for approach shots to get away from you. Bartram Trail Golf Club is the Augusta area's newest entry in the daily-fee offerings. It's very much in line with the area's good, affordable golf. It's the only course in Columbia County to have bentgrass greens, which average a little more than 6,200 square feet. The course itself isn't overly long at 6,700 yards, and can be tricky.